CatDV là phần mềm quản lý, trữ, và truy xuất dữ liệu được thiết kế cho độc lập và hoạt động mạng. Máy chủ CatDV cho phép hoạt động mạng và sử dụng một kiến trúc client-server mạnh mẽ và trung tâm chia sẻ cơ sở dữ liệu, cho phép các danh mục các tập tin được tìm kiếm và cập nhật bởi nhiều người sử dụng đồng thời. 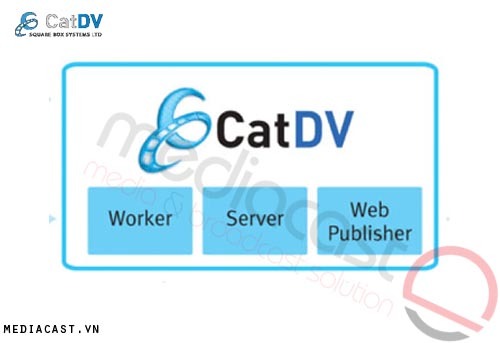 CatDV is a digital asset management system with production management capabilities. For companies that create or manage a large volume of digital media CatDV helps teams organise, communicate and collaborate. Its simple, yet powerful tools support some of the world's most sophisticated media workflows and provide the flexibility to work your way. CatDV brings value to single user installations through to large, dispersed teams in the world's largest firms. Unlike many asset management systems CatDV is easy to learn and deploy, has one of the lowest costs of ownership in its sector and has unrivalled ability to integrate with other products, platforms, formats, hardware and software. Over the last 12 years, CatDV has hundreds of successful deployments across some of the best known names in the media and entertainment world as well as in education, sports, non-profit and commercial settings. At the same time CatDV is used by several thousand individuals. Flexibility: It can fit with your existing workflow and provides round trip metadata management with many different asset types (video, stills, audio, subtitles, documents etc), video formats, NLEs, storage systems, database systems, operating systems and archiving systems. There are APIs and flexible importers / exporters for customers & integrators to further extend the product. Simplicity: CatDV's desktop interface is clean and straightforward. The complexity that comes with the flexibility and power of the product is hidden from the user who can focus on getting their job done. CatDV also has web clients that present a subset of CatDV functions, improving usability further. Cost: CatDV is cost effective and pricing is tiered from stand alone, single user clients to systems that support hundreds of users across large, distributed organisations.